In 2015 Nike made its way into Crossfit, releasing the new MetCon shoes for all high-intensity sport enthusiasts. But the company has actually been involved in lifting sports since 2008. Nike Romaleos 2 have been known as the “heavy-weights” of the weightlifting shoes. If the first edition was labelled as heavy and stiff, the Nike Romaleos 2 shed approximately 25 % of their weight while also improving their flexibility of the forefoot. In Crossfit Reebok is king. In weightlifting however, Adidas and Nike are taking the lead. Most of us end up deciding whether to buy Adidas Adipowers or Nike Romaleos weightlifting shoes. Nike Romaleos weightlifting shoes debuted at 2008 Beijing Olympics. At that time many, especially lighter-weight athletes, complained about its weight and inflexibility of the forefoot. Since then, as reviewed on other pages, Nike Romaleos 2 went down from 620 to 477 grams of weight (or around 25 percent for each size). Although now lighter, the shoes still offer a stable feel. Nike Romaleos 2 are sturdy with the upper section made of synthetic leather. Compared to Adidas or Reebok weightlifting shoes, they offer two straps: the upper one in the tongue area and the lower strap over the mid foot. The heel height is 1.9 centimeters and utilizes the Nike’s well known Power Bridge technology. It is light-weighted but extremely stable. Power Bridge is a contoured TPU heel wedge that allows lifters to feel glued to the floor and as Nike says, to support the foot and bear as much weight as an athlete can handle, without any compressing of the heel. The heel height is 1.9 centimeters. Each pair of weightlifting shoes comes with two insoles. One is softer for training and the other one harder for competitions. Most reviews report they fit well with athletes who have wider feet. Visually Nike Romaleos 2 appear more attractive than any other shoes on the market. They look more like a stylish trainer than an old-school lifters. They come in two intense variants, orange-blue and volt-sequia. For all those heavy dark lifters, the company also designed the black, white and red-gold variants. 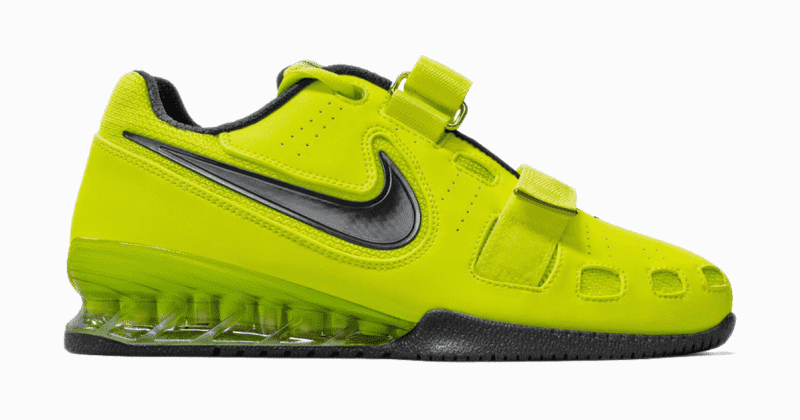 Nike Romaleos 2 weightlifting shoes classify as more expensive – currently around 200 EUR. Nevertheless they are currently – and according to TOP weightlifters – THE weightlifting shoes to wear. Go check out the new Nike Romaleos 3 XD.